Shanthi KrishnaKumar has passed me on a beautiful award. Thank you Shanthi for the award. I'm truly happy and honored! Thanks everyone who stops by my page and takes the time to go through the posts. You all keep me going. Sometimes, I do get lazy - to both cook and blog about it - but I keep doing it so I can give you all something new to read. Besides, as soon as I read a comment from any of you - it makes my day. So, I do it also for my own selfish reasons! You guys are excellent ego boosters! hahah Thank you! 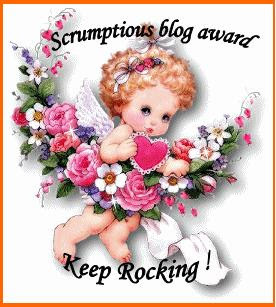 Let them know that they have received this Scrumptious award by commenting on their blog. Share the love and link to this post and to the person you received your award from. You guys have a great blog - keep up the cooking and blogging! Thanks! Thanks a lot for the award. You have a lovely blog out here. Thanks Mrigs!! :) We're having a good time in India now. Will come back in Nov and talk to you. Congrats and thanks a lot for the award.